What if in Tuxemon, like in Pokemon, you could pick berries and fruit and other stuff and cook recipes with them (or feed them to your Tuxemon). I had an idea for one mission to get an item to let you into a PILLAR. You meet this OLD LADY who says, "I want a pie! Will you make me a pie?" If you say yes, she tells you to go behind her house and pick some berries. Then she tells you how to make a pie. When you try to give it to her, she says, "I don't want a pie after all. Here, you can have this pie!" Then you can use it to get past an ENFORCER. So, to do this, we'd need some world sprites and a world sprite generator function. We'd also need a RANDOM_SPAWN_SPRITE function to spawn random fruit on the screen (and you would set on what type of tiles it could spawn on. Cooking and crafting would be fun! Just don't count on it being implemented right away. Hey guys, I've been working on some sprites. To be on the map, they will probably have to be resized, but what do you think? 2) Follow the same style with the items as you would with a tuxemon. For example, all our tuxemon have outlines, but these fruits don't. Here you are! Now they don't seem to look as good. What do you think? Yeah, I added a banana, but it doesn't look very good. I think you're on the right track, but there's a few more tweaks you can do. Even our monster sprites usually have dark grey rather than black borders, and with items I think we can go even lighter. You're also using quite strong colours, and a variety of colours to create a smoother effect. Our palette tends towards fewer, more pastel and milder colours. What I did was look at the Pokemon item sprites, find ones with similar colours to what I wanted, and then finding their closest matches in our palette. Very good job, Sanglorian! You have been very helpful to me! I also made the TuxCoconut. A good base palette, but it needs to look more fibrous and woody. Any ideas or pointers? I had an idea for the fruit - what if they replaced Pokemon's Vitamins? So oranges might permanently boost DEF EVs, bananas HP EVs, etc. Alternatively, they could be temporary boosts, like the battle items. Good idea Sanglorian! Currently the ones added have a weak potion effect, but I figure they could easily be configured to have a vitamin effect! Thanks for your idea! I like the idea that fruit will boost monster attributes. Right now I don't see an easy way to make temporary boosts, but permanent boosts shouldn't take much work. Great work on the sprites! I don't know, maybe you can milk a Tuxemon?!! I really love Harvest Moon, and it could be fun to have some sandbox elements like farming in Tuxemon. I will say that right now, it would be very difficult to integrate something like that in Tuxemon, but we could keep a dialog going about it and make plans for how it would work. I definitely think we should keep a dialogue going. Even if we don't fit it into this game, we'll be finished with this game some day and may want to expand the Tuxemon universe in a different direction. 3. What benefit would implementing this idea have? So I think the simplest application is having plants already existing in the world, that when picked reset to their earliest stage, and that grow based on time passed/steps walked. Then really robust would be a whole mini-farming sim, with tuxemon in paddocks etc. In our draft plot, we have several times when the protagonist returns to places he/she has already been. So if he/she picked the plants on his/her first time through, they'd've grown back by the same he/she comes by again. That's a nice touch, I think, and gives the player a bit of a boost. So I think even implementing this concept at its most simple could be very rewarding. One thing ShadowApex mentioned as being a concern is that if there's a finite amount of money in the world (X number of trainers, you get a certain amount of money for defeating each one), a player might run out and find the game very difficult. The existence of these plants would help, because if all else failed you could leave your game running for X hours, then pick all the seeds, and sell them for some money. (There are a few other ways of fixing this as well, like allowing players to have re-matches with trainers they already fought). 1. What's the simplest application of this idea? 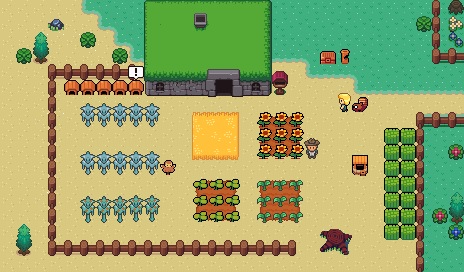 I don't think a whole farming clone of Harvest Moon fits the direction of the game, but having flower pots or planters...designated areas...for things to grow will fit better. Maybe even a green house, but not a field or anything. 2. What's the most robust application of this idea? At risk of becoming a time management game like farm ville, maybe expanding the "start something, wait, return and collect" mechanic to egg hatcheries, the fusion device. There could be a game item that requires power, so maybe it needs game time to recharge. Giving the player a little extra side work is good overall, especially if it awards some bonus like cash or xp, to reduce the grind. For map designers, we could incorporate elements of the map or story that change when you return to collect your growing plats/items/TXMN. Back again from a camping trip!! Yes I thought of you josepharaoh99 when I saw those sprites! I like the bushes in CaCh (Catch Challenger)! They look great, and we should probably use them for berries and related food. Yeah, I think you should be able to do that for sure. I'm not so sure we should do a full out farm thingy, unless it's an optional mod to download. I've thought about this, also. 1. Rematches should be allowed in some cases. 2. Each town should have jobs for you to do to earn extra money. 3. Fulfilled goals should give extra money (and maybe even Tuxemon XP). * Consumable items are mostly fruit, vegetables, seeds, and so on. For example, instead of an ANTIDOTE, we could have an ANTIDOTE APPLE. Instead of CURE BURN, we could have BURNBALM MELON. * There are fertile patches scattered around the world, especially in your backyard. * When you acquire the HOE item, you can hoe a fertile patch. * You can plant a fruit/vegetable/seed, etc., in the hoed patch. * After X steps, the seed grows into the next stage. After another X steps, it grows into the next stage, and so on until you reach the final stage. * If you have a WATERING CAN, you can water each patch. That halves the number of steps it takes until it grows into the next stage (then it dries out and has to be watered again for the next stage). * Then if you have a SCYTHE you can harvest the plant, and get multiple copies of whatever item you planted in the first place. The patch becomes bare, waiting to be hoed again. What do people think of this? It seems like a limited but useful way to introduce farming. Lori, I like the idea of acquiring items first before being able to farm/plant things. I also like the plant items could be used in place of "normal" consumables, but I think it would be odd to replace all consumables with plant versions. I too think, replacing everything is a bit much..
one way is: just wait. if its nothing bad, itll go away. a possible way for tuxemon: antidote will cure poison instantly. but if you use antidote on a healthy tuxemon, that one will get sick. that stuff isnt very strong, it will heal you slowly. the good thing is, its not removing the problem. it makes your body stronger, so that you can deal with the problem yourself. long term, you will get a healthier person and the chance to get sick in the future lowers. a possible way for tuxemon could be: if you use a antidote berry, your tuxemon might not get cured (40% chance for cure as an example) but if it works, your tuxemon will get sligtly resistent to poison. so during that battle, if you cure yourself with a berry, the chance to get poisoned is strongly reduced. also the berry might heal your tuxemon a slightly little bit. if we do this, we have multiple ways to deal with status problems, as in real life.